My friend introduced this recipe to me and I was hooked at first taste. Of course I doodled around and made it my own, ’cause that’s just what I do. That’s the fun of cooking; you can adjust any recipe to suit your tastes, your mood, or your whim. I call these “with herbs” because you can really use any hearty herb while roasting them: bay, rosemary, thyme, oregano or a combination. 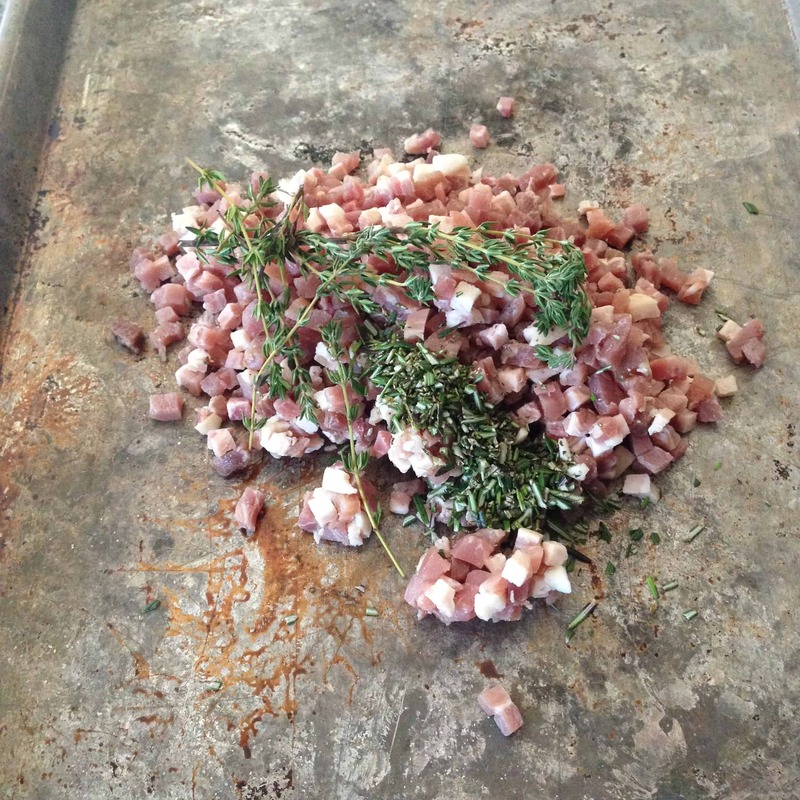 And you can toss on any soft herb just before serving: chives, parsley, or dill. You pick! And if herbs aren’t your thing, you can’t go wrong with just salt and pepper. The spicing and herbing is completely up to you. Be creative and use what you love! 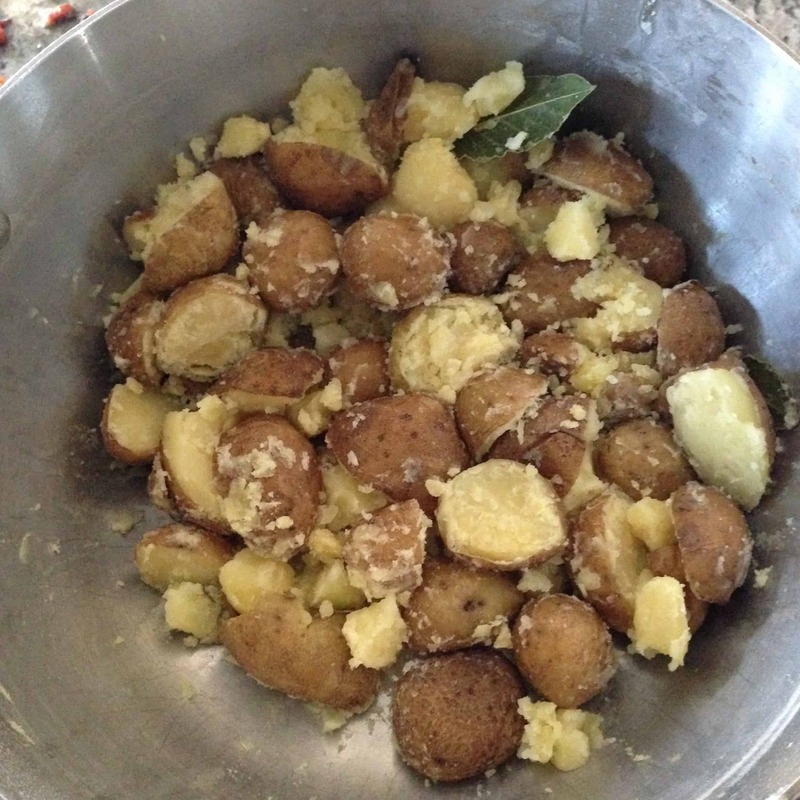 I grew up eating my dad’s rosemary roasted potatoes, so I have to add it, and I add bay leaves and garlic anytime I boil potatoes–whether for mashed potatoes, potato salad, or these wonderful babies. It really adds something, but again, this is totally up to you. The technique is really neat, too. Besides being really fun, the shaking breaks up the potatoes, and coats them all in a thin layer of mashed potato, so when they roast they get really crispy on the outside. Slice the larger potatoes in half, and if you have smaller ones leave them whole, even if they are all the same size, leave a few whole. 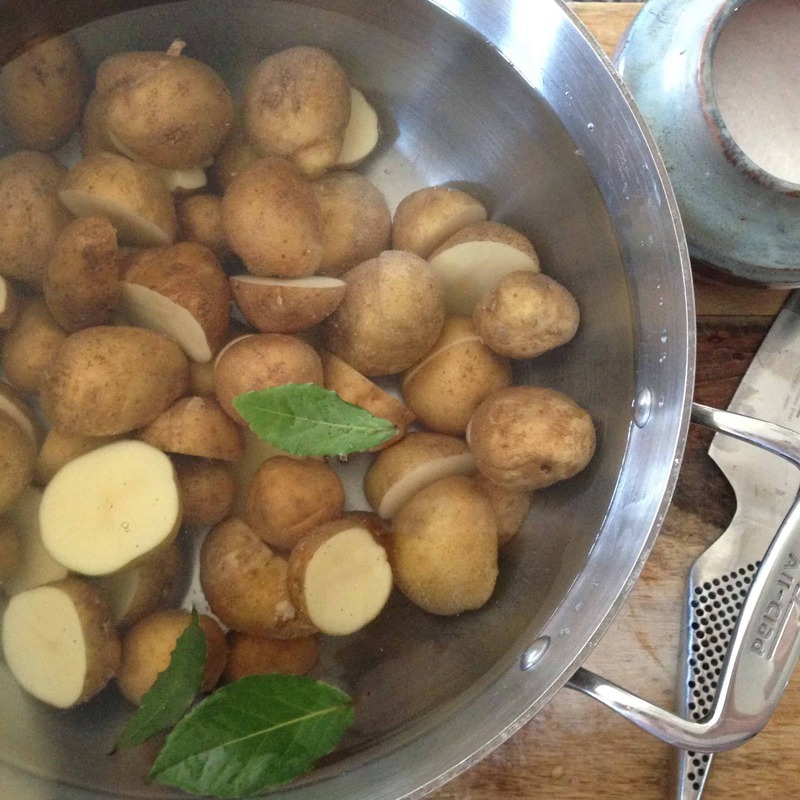 Add potatoes to a large pot that has a tightly fitting lid (the lid will come into play later), cover with water so that potatoes are covered by 1 inch. Salt the water generously (like you’re cooking pasta), add bay leaves and garlic cloves, and bring to a boil, reduce to simmer and cook for 10 minutes. 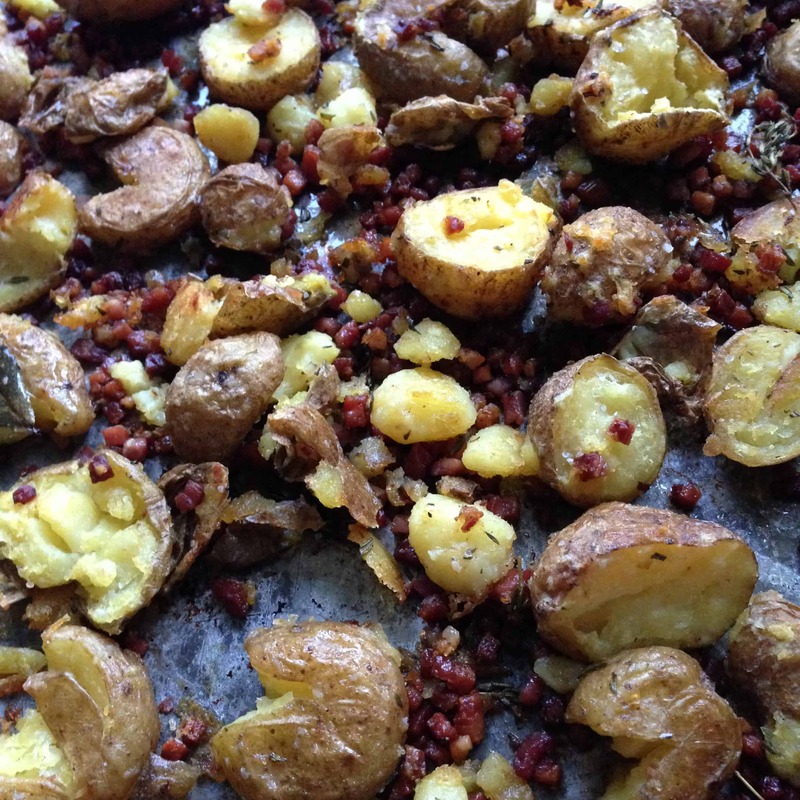 Meanwhile, place pancetta or bacon and herbs on a sheet tray and roast while potatoes are simmering. After ten minutes, remove sheet tray from oven and raise oven temp to 425. Drain potatoes in colander, return to pot, and with oven mitts or a towel, carefully and firmly grasp handles and lid of pot. Make sure it is tightly closed and shake vigorously for 5 seconds. You should have some pretty mashed up looking potatoes when you’re done. Add potatoes to the sheet tray, and with a wooden spoon or spatula, gently press down on the whole potatoes, so they pop under the pressure (this is very satisfying, and now you will understand why I told you to leave a few of them whole). Drizzle with olive oil, sprinkle with salt and pepper (about 1/2 teaspoon pepper and 1 teaspoon salt; keep in mind the saltiness of the pancetta/bacon), toss to combine and roast for another 20-30 minutes, tossing occasionally, until the skins get crispy. Serve alongside anything. Or just pile them into a bowl and enjoy. No judgment here. *Recipe adapted from The Barefoot Contessa Foolproof cookbook.